Hepatitis C is a disease caused by an RNA virus. Up to 70% of patients infected by the virus are asymptomatic. How can I get hepatitis C? Hepatitis C is transmitted through contact with infected blood. IV drug use is the primary cause of infection though tainted blood has been cause of infection in the past. 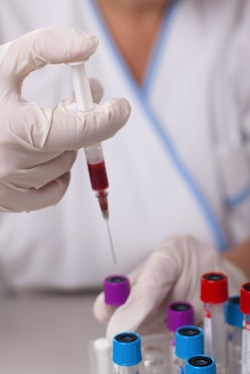 Current blood testing procedures have all but eliminated transmission via blood transfusion. About 5% of cases are transmitted during sexual contact. The majority of hepatitis C infections are asymptomatic. Yellowing of the skin is typically the first symptoms. This symptom appears in about 10% of cases and resolves without additional symptoms. Lacking symptoms, most patients develop chronic hepatitis C.
Can I test for hepatitis C during pregnancy? Pregnant women can be tested for hepatitis C, but the test is not part of normal prenatal testing. If the pregnant woman is at increased risk of infection, due to intravenous drug use or positive HIV test, testing can be completed. EIA assay and hepatitis C RNA assay tests will be ordered to diagnose the condition and report viral load. Albumin, liver function and prothrombin time tests may also be ordered to check for damage to the liver or assess liver function during pregnancy. What are potential complications with hepatitis C in pregnancy? Hepatitis C passes from birth mother to infant about 5% of the time. This equates to infant-infection during 1 in 20 births. There are no medical measures available to prevent transmission during childbirth. There are no clinical studies reporting adverse outcomes on pregnancy, but there have been reports of premature delivery in women with hepatitis C. No increased risk of stillbirth, fetal malformation or fetal malnutrition has been reported. The aim of hepatitis C treatment is to reduce the presence of the virus in blood. Antiviral medications are often the first treatment of choice, but not all medications used to treat the virus are safe for use during pregnancy. Ribavirin, one antiviral medication used to treat hepatitis C, is not safe during pregnancy or for six months following pregnancy. When treatment is approved, injections of pegylated interferon alfa typically last for up to 48 weeks. Injections are supplemented with ribavirin. Can I breastfeed with hepatitis C? Breastfeeding with hepatitis C does not appear to increase risk of transmission to an uninfected infant, but the National Institutes of Health suggests talking with your physician about feeding options and potential risk factors before breastfeeding.